PVC-ALU window Synego CLIPP with triple glazing (4 – 18 – 4 – 18 – 4 TGI) is a very durable and the most energy-efficient system of PVC Nagode windows (Uw = 0.77 W/m2K). 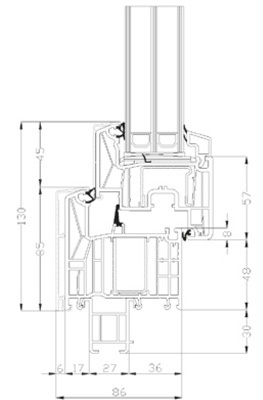 It is suitable for passive houses. 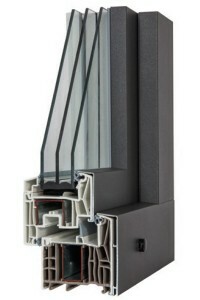 Thanks to the future-oriented design, PVC-ALU windows Synego CLIPP allow various architectural options. The mounting of the window is fast and simple due to its practically designed profile, which is made of recyclable material, making the window to be recognized as environmentally friendly. The profile Synego is extremely stable because it is made of high-tech material called RAU-FIPRO. What is more, aluminium cladding additionally protects the window frame from bad weather conditions and makes it highly damage-resistant. You can design profiles in line with your aesthetic preferences; you can choose the indoor color of the profile in a decorative foil or varnish, and the outdoor aluminium color from the RAL color chart, as well as other accessories for PVC windows. PVC-ALU windows Synego CLIPP of the line SYNEGO are also available in the PVC version without the aluminium cladding, namely with the profile Synego.